How many of the 28 restaurants across town that are participating in the ninth annual edition of Fall Dine Huntington Restaurant Week have you been to? One? A few? Good, but there’s still time to hit a few more. Restaurant Week continues through Sunday, Oct. 15 (Saturday until 7 p.m. only) and restaurants are offering discounted, prix-fixe, three-course meals at one of three select price points. The $20, $30, or $40 price structure is a new addition to the usual restaurant week fun, opening the doors for even more of your favorite restaurants to participate. 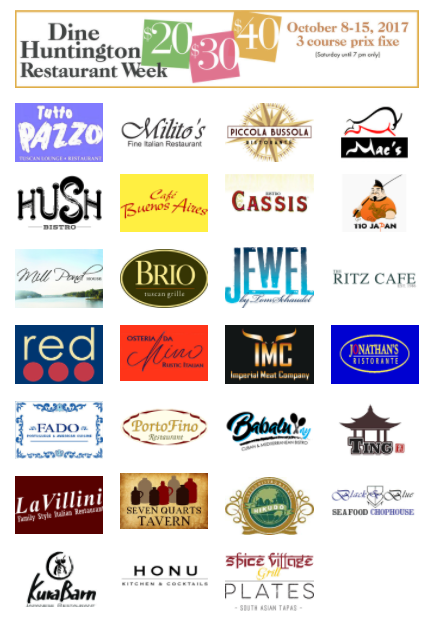 For the complete list of participating restaurants and menus, visit DineHuntington.com or click the photo below.